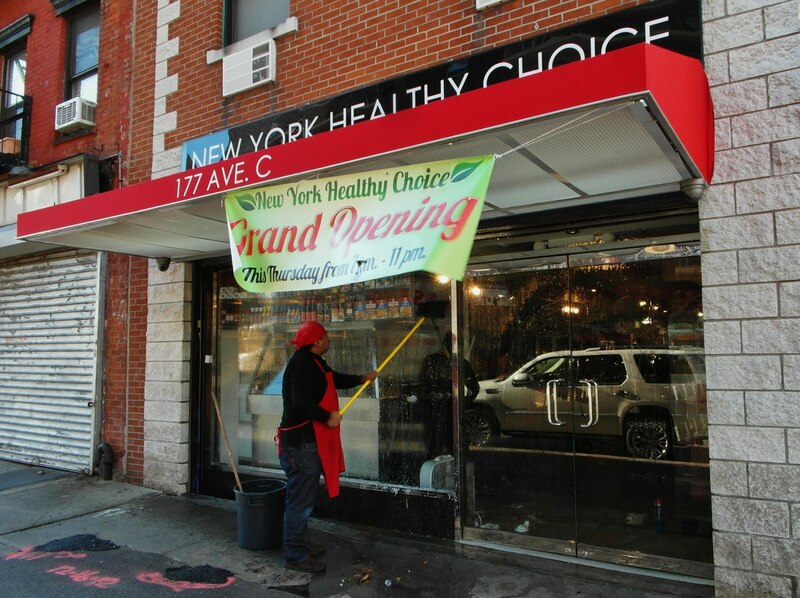 Several of us have been curious about what to expect from New York Healthy Choice, the new market opening on Avenue C at East 11th Street. Bobby Williams notes that the store opens this morning at 7. The owner of this is the same person/people who own Yankee Deli and the incoming Yankee Pizza across the street. I spoke with a couple of people at Yankee Deli a few months ago about it and it is essentially going to be a fancier grocery store for the neighborhood with a — their words — "HUUUGEEE butcher counter". So, yay!, good meat. Was only a week or so from opening at the time of Sandy, but obviously that timeline had to be changed. The last tenant, the Monk Thrift Shop, closed in December 2010. At the time, neighbors heard that a bank branch would open here. Oh wow! I should definitely visit this. I'll probably never shop at New York Healthy Choice, but that has to be better than another Shitibank branch.